Go beyond simply arming and disarming your business or property. Our advanced alarm technology enhances your security and your life. Lucky for you, We Gotcha Covered. Our business alarm system is the perfect to tool for you to protect and manage your property. System is accessible on your phone, laptop, tablet, and even Apple Watch. You never have to miss a thing! Receive real time alerts of abnormal activities such as unauthorized attempts or delays in opening/closing. Electronic locks eliminate the need for physical keys. Reduce costs as well as ensure no unauthorized persons have access to the facility. E-locks can be monitored and controlled remotely. No more worrying if you left the door unlocked. Environmental controls allows remote status and operation of thermostats, lights, and sprinklers. Automatic routines can lock door, adjust thermostat, control lights, and arm/dis-arm system. Run these routines when you leave for the day to ensure optimal security and savings. Flexible billing options to meet your budget needs. We typically install and monitor alarms for restaurants, retail stores, doctors offices, other office types, and manufacturing/distribution facilities. We are happy to help any business in need though. Protecting what is important to you is our #1 priority. We also offer enterprise level management for businesses of all sizes. 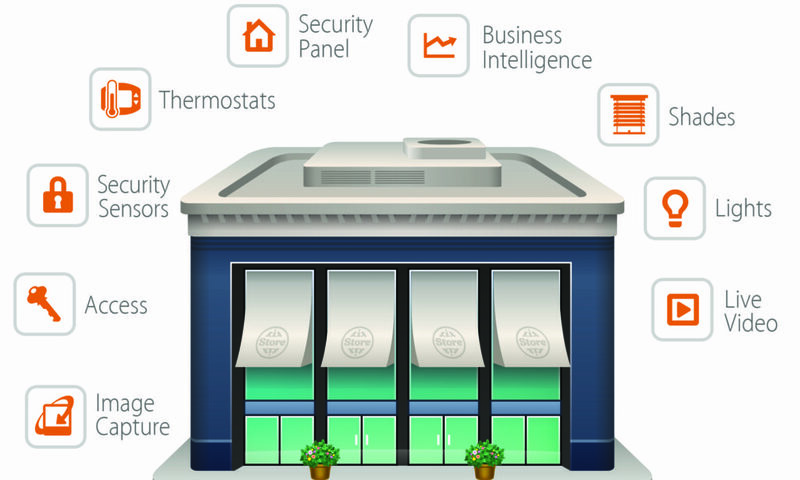 Monitor multiple aspects of all your locations in one easy-to-use interface. For a free alarm consultation, call us at 678-430-3116.